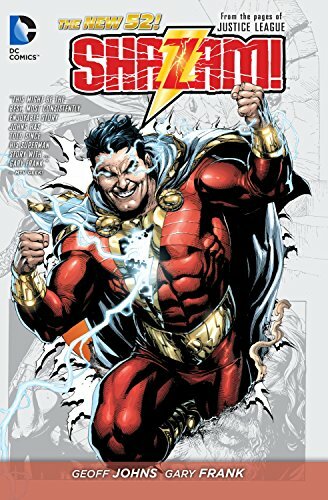 Shazam!, AKA Captain Marvel (though they don’t use that name lately because… you know! ), has a backstory at D.C. Comics which will catch most modern comic fans by surprise. Originally the name SHAZAM was an acronym, standing for “Solomon, Hercules, Atlas, Zeus, Achilles and Mercury” – a combined coda of “immortal elders” all sampled from Greek Roman, and Abrahamic mythology. That’s a naming gimmick you don’t see every day. His muggle name is Billy Batson. In the Golden Age of comics yore, Shazam was D.C. Comics’ best-selling titles of the 1940s, outselling, yes, Superman himself! He was also the very first superhero to be adapted from the pages of comic books to film – under his competitor’s namesake moniker, a serial film series called Adventures of Captain Marvel, first showing in 1941. There was quite a bit of squabbling around Shazam’s ownership, in fact. Fawcett Comics was the first to publish the character, originally in Whiz Comics. D.C. (which originally stood for “Detective Comics”) sued for copyright claiming Shazam was a rip-off of Superman. The legal tug-of-war went through a round of appeals until Fawcett dropped Shazam and D.C. revived it starting in the 1960s. It isn’t often we get a comic-to-film reboot that’s literally older than WWII. There was also a live-action TV series in the 1970s, and an animated TV adaptation by that great sausage factory of Saturday morning cartoons, Filmation. Shazam curiously seems to have fallen by the wayside these past few decades until now. This New Line Cinema film version, releasing April 5th, feels like a fresh take on the superhero formula. Like Marvel’s Deadpool, Shazam is a character who’s not afraid to be taken less than seriously. Now maybe some fans aren’t on board with this approach, but quite a few of us are yearning for a breath of fresh air from the dark, deep, anti-hero, pitch-black egocentrism of the current trend in superhero movies. This fits, because Golden Age comics had a far different tone from modern dramatizations. We don’t yet know exactly how that will translate into film just yet. At first he does sound a lot like Superman, but an important distinction is that Supes is invulnerable to almost anything; Shazam is not. Also Shazam brought in his whole family to join in the fun, able to bestow his powers in small doses upon his relatives. And by the way, Shazam, unlike some Kryptonians we could name, is a human from good old Earth. 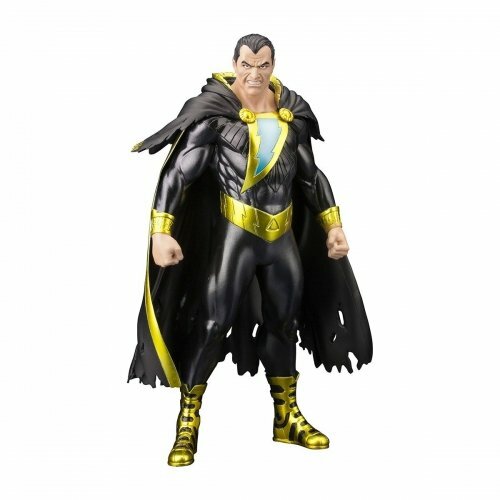 Now that you’re caught up on at least an overview of Shazam’s history, you’re all set for the flick; and be sure to check out these collectible figures to get started on the Shazam wing of your superhero showcase. 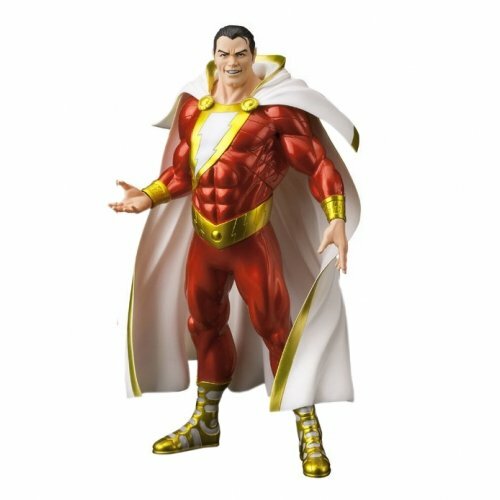 This Japanese translation of Shazam is a solid figure standing just over eight inches tall. While it’s not based on the movie, it is a recent update on the character, showing him in more traditional Silver Age form. We should explain about Black Adam. He was originally an alternate-version type nemesis for Shazam, but has recently been recast as more of an anti-hero. Like Shazam, Adam was the former holder of these immense powers, but became corrupt. Black Adam is supposed to have his own movie in here somewhere or not, it’s complicated. 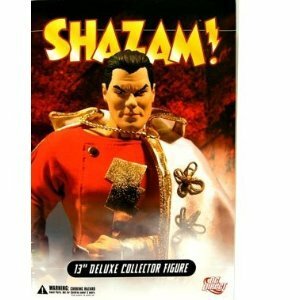 Anyway, this is the statue figure counterpart to Shazam above. The dynamic packaging makes this an attractive prospect for never removing from the case, just to watch it spike in value. 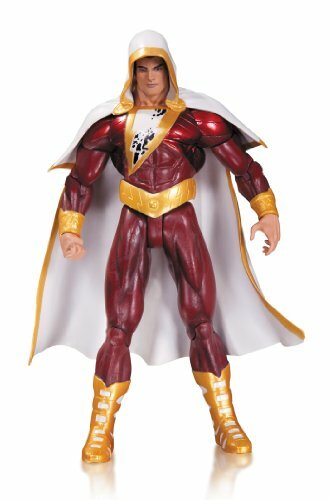 This is definitely Shazam in Golden Age form, lovingly reborn as a displayable figure. This is the Justice League iteration of Shazam – there’s a lot to catch up on with a character nearly a century old, OK? 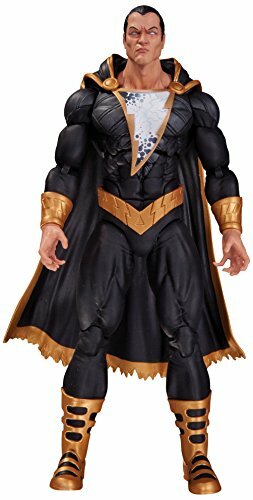 This figure has a re-imagined costume with the Gary Frank version of Shazam’s bolt insignia and with a mysterious hood added to the cape. Poseable, too. We’re starting to warm up to Black Adam more. This is the Black Adam design from the recent Forever Evil crossover, and is he ever intimidating! What a cocky sneer! By the way, did we mention at one point Dwayne “The Rock” Johnson was tapped to play Black Adam? It apparently didn’t go through as planned, but they’re planning on giving Rock his own Black Adam movie instead – stay tuned!